Show off your faith with this dazzling cross pendant. 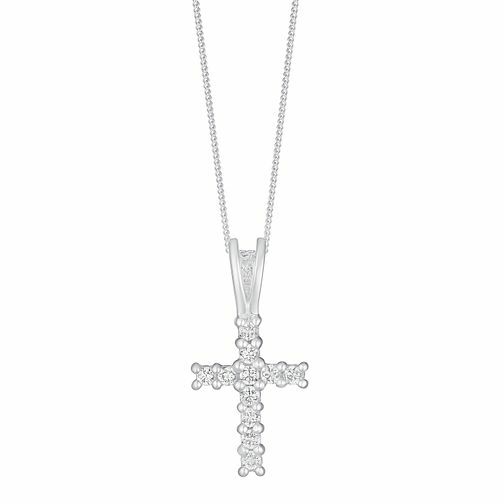 Featuring a traditional cross design, this stunning pendant is crafted from sleek sterling silver and claw set with shimmering cubic zirconia stones. Sterling Silver & Cubic Zirconia Claw Set Cross Pendant is rated 5.0 out of 5 by 1. Rated 5 out of 5 by Anonymous from Lovely item This pendant is lovely and well priced. I bought this for myself and I am very pleased with it although the picture comes across as the item is much bigger, so a little disappointed with the size.